People traveling in canoes along the Oxtongue River in Ontario, Canada, stop to enjoy the scenery and capture a picture or two. Canoeing the Oxtongue River in Oxtongue River-Ragged Falls Provincial Park in Ontario, Canada is an incredible way to view the Autumn scenery surrounding the area. Either side of the river is adorned in an array of hues, as Autumn has taken over the wilderness along the Oxtongue River. Canoes take a breather along the banks of the river, where the wilderness is at a standstill except for the movement of the water. 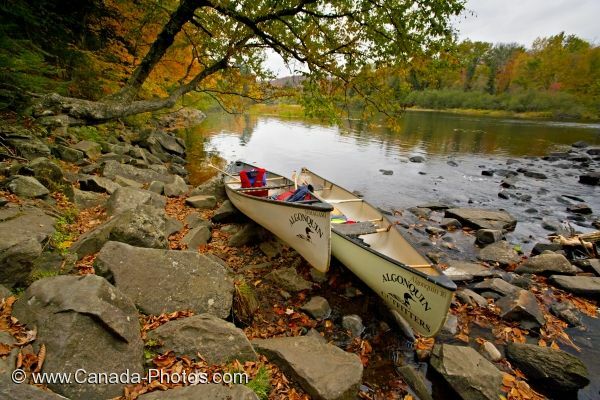 Two canoes on the bank of the Oxtongue River in the Oxtongue River-Ragged Falls Provincial Park, Ontario, Canada. Picture of the Autumn scenery from the banks of the river in Oxtongue River-Ragged Falls Provincial Park in Ontario, Canada.